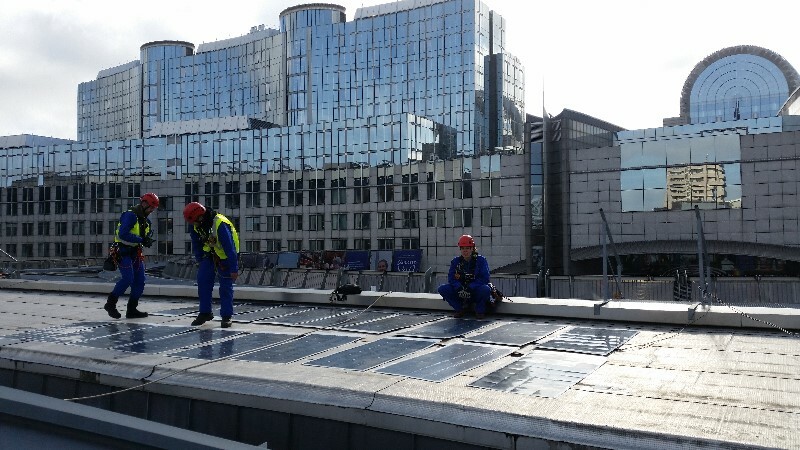 Brussels – Activists have installed solar panels on the European Parliament in Brussels on the day EU talks on renewable energy enter a crucial stage. The Parliament is hosting the penultimate round of negotiations on the EU’s Renewable Energy Directive. The outcome of the negotiations will determine the role of renewables in Europe’s energy system through 2030 and beyond, as well as the potential for Europeans to self-generate, consume, share and sell electricity. The group of 20 activists and climbers from seven countries  also unfurled a banner covering the front of the European Parliament’s information centre and placed a giant sun in front of the Parliament, reading: “Our sun. Our power. Our future.” The banner and the sun were covered with hundreds of selfies, sent in by people all over Europe, calling on the European Union to power a swift transition away from fossil fuels and nuclear energy to citizen-owned renewable energy. The activists are using the electricity generated by the solar panels installed on the Parliament to make and distribute free vegan ice-cream. At the same time, activists in Spain have installed solar panels on a building belonging to the energy ministry in Madrid, demanding that the Spanish government stop penalising people who produce their own energy. Research by Greenpeace Spain released on Wednesday revealed that the Spanish government uses only 1.25 percent of the space available for solar panels on ministry buildings, wasting around €27 million in public money to buy electricity from power utilities. The European Parliament is set to clash with European governments over the rights of households, cooperatives and cities to produce and sell their own renewable energy without punitive fees or excessive red tape. For example, the Parliament would like to see an end to measures like the Spanish ‘sun tax’, which imposes steep fees on anyone placing solar panels on their roof and using the electricity in their own home. Other rules favoured by governments would, for example, place additional burdens on tenants living in apartment blocks and require those feeding even small amounts of electricity into the power grid to comply with the same obligations as large power companies. The Parliament also disagrees with governments over the minimum share of Europe’s energy that must come from renewables by 2030. Most governments favour a 27 percent target, but some countries, such as Sweden, have backed a minimum 35 percent target, while others have said they can go beyond 30 percent . The Parliament is also calling for a minimum 35 percent target. Having more renewable energy in the mix would improve air quality  and reduce carbon emissions. Greenpeace warns that a renewables target of at least 45 percent by 2030 would be in line with the EU’s commitments under the Paris climate agreement. A 2016 report commissioned by Greenpeace and others showed that, with the right support, almost half of all Europeans could produce their own electricity from renewables by 2050, meeting nearly half of the EU’s electricity demand. Power companies would provide the remainder of Europe’s renewable electricity. The final negotiating session between the European Parliament, EU governments and the European Commission will take place on 29 May. Belgium, the Czech Republic, Finland, France, Hungary, Italy and the Netherlands. Austria, Denmark, France, Portugal, Lithuania and Luxembourg have indicated they can support an EU 2030 renewable energy target beyond 30 percent. The European Commission is expected to refer several European governments to the European Court of Justice over breaches of the EU’s air pollution limits today.